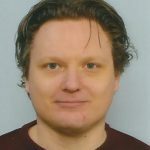 I always had a soft spot for the vintage analog synth sound, so with a lot of pleasure I’ll do a review of the new softsynth from Synapse Audio Software: “The Legend”. There are two versions of this synth: a Reason Rack Extension for Propellerhead Reason and a VST/AU version for the VST/AU supporting DAW’s. The version I’ll review here is the VST version. 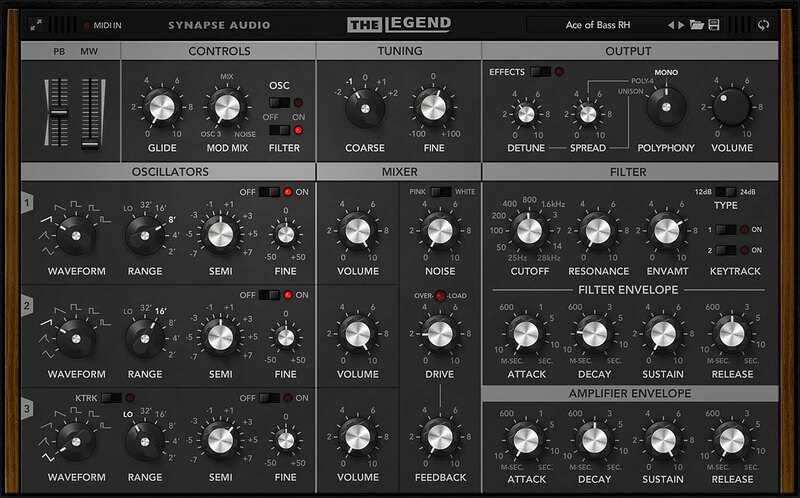 “The Legend”… With a name like that comes expectation, and I can say this synth really delivers. At the moment I fired this synth up and did a little walkthrough of the factory presets it immediately brought a smile on my face. A great rich analog sound and good bottom end. A real joy to play with. This synth is positioned as an analog modelling synthesizer “faithfully recreating the most iconic synthesizer of all times”. Looking at the GUI and listening to its sound it’s not hard to see that we’re talking about a classic Minimoog emulation here. Synapse Audio Software created this synth in cooperation with Bigtone Studios who brought in a well preserved Minimoog Model D to use as the reference synth to model the VST after. Since I don’t have a classic Minimoog to compare with, I’m not going to judge how faithful the emulation exactly is, but it sure sounds very good and definitely like a Moog. There’s a video on the website of Synapse Audio Software with a comparison between The Legend and a hardware Minimoog, and in a blind test I wouldn’t hear which is the hardware- and which is the software synth. So that’s real close. I believe this synth is a really good emulation. I played some other Minimoog emulations, but this one just sounds that tad better to me. Personally I don’t find it that important if the emulation is 96, 98 or 100% accurate. When I’m playing this synth, its sound really gives me the feeling I’m playing a great analog synth with that rich “Moogy sound”, and that’s what matters most for me. I’m not going into detail about the core architecture. It’s Minimoog based, so 3 oscillators of which one can act as an LFO for modulation, a noise generator, a 24db low pass filter (which unlike on a Minimoog can be set to 12db as well), and a VCA. 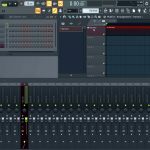 Synapse Audio Software did a nice job of adding 4 note polyphony and unison to the feature set, which makes the synth somewhat more versatile than “just” a monosynth. Oh, and before I forget, they also added the feedback loop which on a Minimoog is created by sending the master output back into an external input on the synth. Nice! What I would like to highlight are the details which we’ll find on the back panel of the synth (the GUI is switchable between a front and a back panel). Here you’ll find some nice features like a 50 or 60Hz power supply selector to emulate the effect of the different power supplies on the sound. There’s also a selector to switch between an early revision model D Minimoog- and a late revision model D Minimoog emulation. The early model D Minimoogs had some small internal differences from the later model D’s. One of these differences for instance being another oscillator board. Switching to the early model will emuIate these differences. Personally I find the sound in the “early model” mode somewhat fatter and juicier. There’s also a knob to set the amount of saturation for the signal in the amplifier stage, and a “symmetry” knob to set the amount of asymmetric effects in the filter stage which can add to the authenticity of the analog character of the sound. Even the amount of oscillator drifting, which is characteristic for early analog synths, can be adjusted with the drift knob. Furthermore, there are some knobs to set the ranges for the filter cutoff, resonance, pitch bending and pitch- / filter cutoff modulation and you’ll find switches for note priority, and mono retrig/legato mode. To polish the sound there’s a reverb and a delay module implemented in the synth. I created a little track with all the sounds from this great synth. Also the effects used (reverb and delay) are only from the synth. A total of 13 instances of “The Legend”! 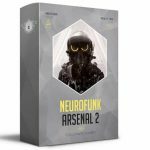 I think “The Legend” is a great synth and if you like vintage analog sound this is a great addition to your VST collection. You can easily dial in good sounds fast. It’s great for fat basses and classic analog leads, but also does a very nice job for creating trance or other EDM style leads, plucks and basses. 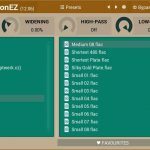 More than 400 factory presets from different sound designers also make that clear. Selling at €89,- / $99,- the price is certainly fair and in line with other synths of this type. You can grab a demo or buy the synth on the website of Synapse Audio Software. Synapse Audio Software and Bigtone Studio’s did a great job with this synth! 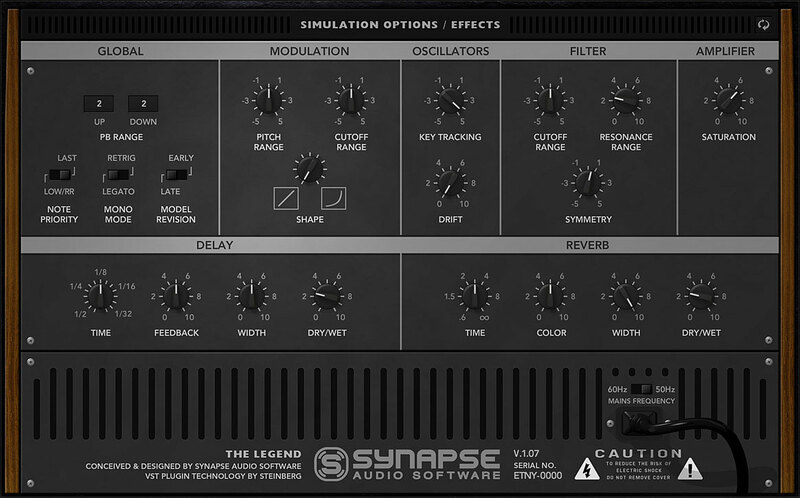 Recently, Synapse Audio Software updated “The Legend” to version 1.07. 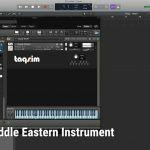 With this update, they added MIDI Learn and LegendFX to the package. 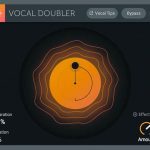 LegendFX can be added to the effect chain of your DAW and makes the Reverb and Delay of the synth available as an effect to other instruments. You can also use the synths filter with its corresponding features on other instruments which I myself find the nicest addition with this update.